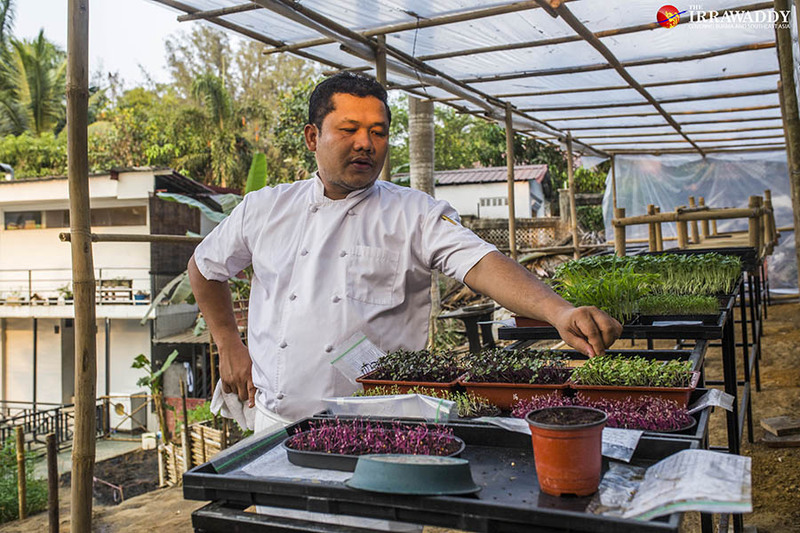 Chef Orng Joitamoi, tall and broad-shouldered and dressed in a crisp white chef’s uniform, is walking through his small organic farm, plucking leaves and flowers and handing them to me to taste. He recently marked one year since graduating his restaurant, Orng Kitchen, from a pokey, downtown venue to this quiet, leafy neighborhood in Mayangone Township. His 30-seat restaurant is completely open to a pond where four geese were swimming in formation. The pond is ringed by the farm with stepped vegetable beds and boxes under swaying eucalyptus trees. We all comment on how un-Yangon-like it feels here. Originally from a village outside Mawlamyine, the capital of Mon State, Orng Joitamoi moved to Edinburgh, Scotland, to earn a masters in politics, encouraged by his family and the promising changes that were taking place in Myanmar. During his studies, however, a kitchen job he took became more than just a way of making ends meet. A deep passion for cooking began to boil within, and by the time it came to write his thesis he had emotionally checked out of politics. 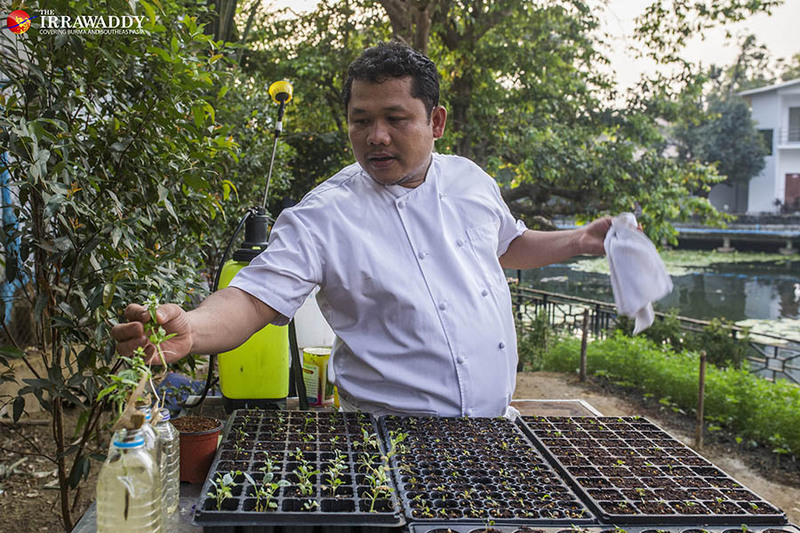 He prides himself in using the best available ingredients sourced in Myanmar — and indeed from his own garden — to create incredibly delicious and well-presented dishes on par with any other fine dining restaurant Yangon has to offer. 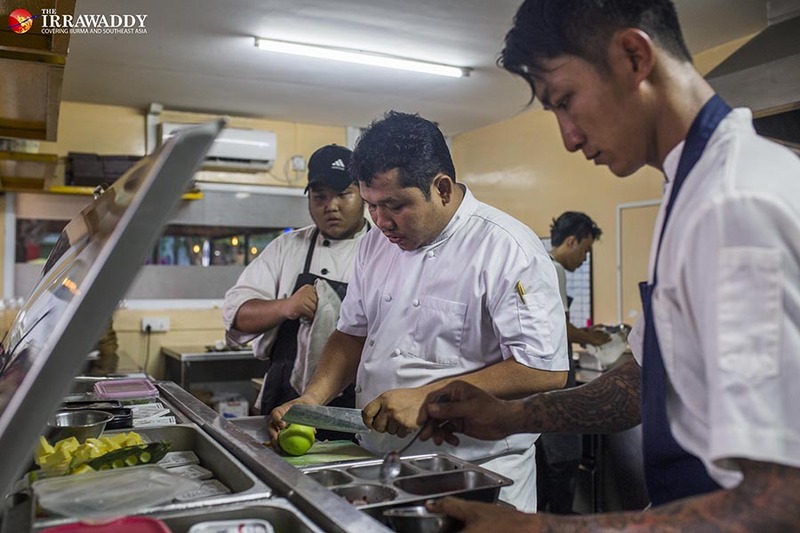 In his humble way he discusses what winning two Myanmore awards — Chef of the Year in 2018 and Restaurant of the Year in 2019 — means to him and that despite the whirlwind of success and attention, he will never change Orng Kitchen’s concept of affordable, high-quality dining in a comfortable and unpretentious atmosphere. How have things changed since you came back to Myanmar and opened your own restaurant in 2017? We started out in a small restaurant in downtown Yangon. We were doing OK at the time, but we weren’t well known yet. After [one] year, I won the Myanmore Chef of the Year Award and soon after that we moved up here. The expectations put on us after winning the award gave me a lot of pressure, but at the same time motivation as well as recognition from both guests and experts from the industry. This is huge motivation for me. Our game is changing. Even our farm has improved massively. Our service, our team, our food has improved 10-fold. What or who inspired you to follow this career? No one. My parents sent me to the U.K. to study. I grew up in an environment where it was all about politics — my family, my people, my environment. The people who influence me were all about politics. I went to the U.K. to get a master degree in politics but at the same time I was working in the [restaurant] industry. I started to fall in love with that industry and by the time I was writing my dissertation, I wasn’t there anymore. I just wanted to cook. 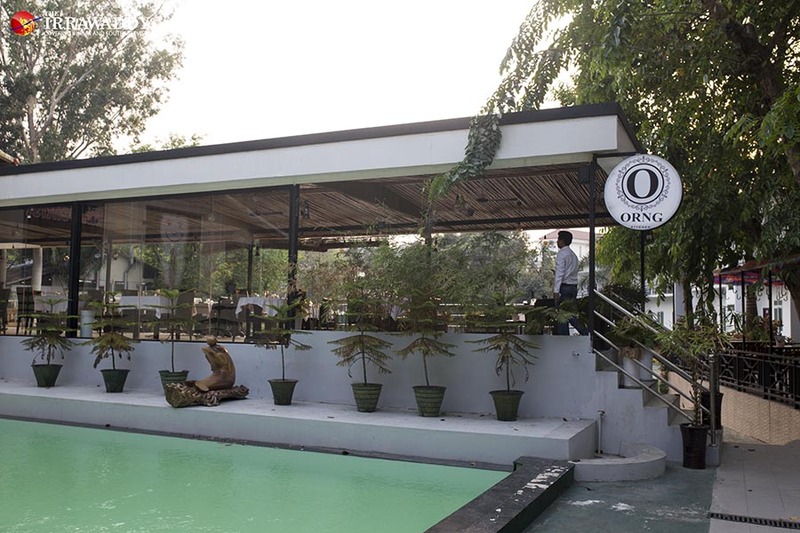 The menu at Orng Kitchen stands out from the other fine dining and high-end restaurants here because there is a special Myanmar feel to it. It doesn’t try to pretend to be in Europe. How did you arrive at this point? What influences your menu? My menu is seasonal. What works for me is to be flexible with my menu. I have a supplier who phones me and says, “I’ve got this. I’ve got one special fish.” I’ll put it on the menu. I’m a firm believer of eco-friendly practices and [protecting] the environment. And look at our restaurant; it’s an open space. The amazing fish and seafood that we get in [Myanmar], we export it all over the world. Why would we use imports when we have this? How much pollution does it create to get one salmon here from Europe? Of course people love [imported food] and people do request it and we sometimes have it. But on our permanent menu, 100 percent of our food is locally sourced. What are the main struggles in the restaurant industry in Yangon today? How do you stay at the top of the game? We have a Burmese saying about people who try to run before they can stand on their feet. What’s happening with the young generation of chefs these days is they watch YouTube and Gordon Ramsey and test things at home and think they can run it in a restaurant. It’s a totally different game. It took me 10 years in the industry [to get here]. It took a few years of peeling vegetables and chopping bones before [I became a cook]. Young chefs need to understand the culture of the kitchen and the working environment. They need to be trained [on] the very basics. One of the most interesting facts about Orng Kitchen is that we have a commis chef from the Deaf Chefs Association…. He can make some basic pastries and all the breads. We have a young [employee] who’s an ex-child soldier and we have an ex-prisoner. One is from an orphanage. The kitchen is full of characters. I take pride in being able to give these young generations opportunities. Definitely it’s not Masterchef, TV programs or YouTube! At Orng Kitchen you personally play many roles, from head chef to trainer to business manager and the face of the business. How do you manage that? I have to admit, when I first opened Orng Kitchen I never thought it was going to be that much of a challenge, that difficult. I thought it’s easy — I can cook, I can create a menu. I thought it’s easy. Actually, it’s not. 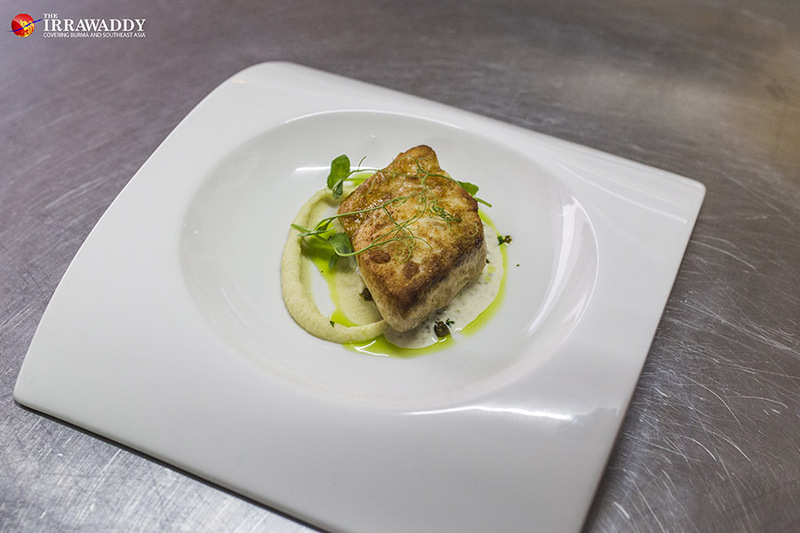 To stay on your game, on the top of the game in [food and beverage], you have to be ready twenty-four-seven. I don’t know, it’s just the passion. Also, when we first opened, through lack of options, I didn’t have any choice, I had to do everything by myself. I couldn’t afford to employ people to do this and that. Of course, now I have stepped back from some roles, like answering the phone and Facebook messages and emails, because now we have an amazing front-of-house [staff] and our manager is amazing. Our front-of-house trains the service staff. In the past three months my life is a lot easier, so I can fully focus in the kitchen because I have an amazing team behind me. Tell us about your new farm. Why did you take growing food into your own hands? First of all, I come from a farming background — all my family, all the generations, they are farmers. Also another things is that when we first opened Orng Kitchen in downtown, I went to the fruit and vegetable market and the wet markets. The vegetables I found there were really disappointing, full of pesticides and full of chemicals. I tasted some of the raw vegetables and I could feel the chemicals. That, for me, it’s not right. Before we moved up here, I asked some of my relatives in Mon State to grow some of the vegetables for me. Even the onions…all onions for Orng Kitchen next year are going to come from Mon State. Some of the salad and micro-greens — I focus on some of the vegetables that we’re going to use raw — it is very import that is chemical-free. I showed you around earlier and you tasted some of the leaves; there is no taste of chemical. It’s very natural and very flavorful.